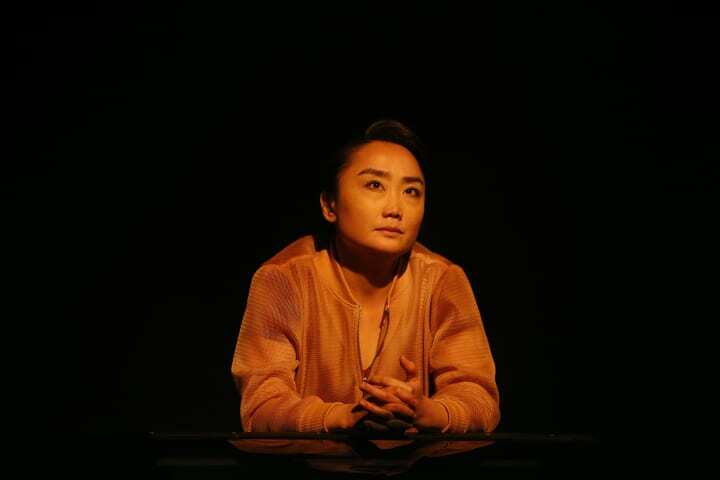 MTC Education asked Kaylene Tan to delve into Jean Tong’s play Hungry Ghosts. The term ‘hungry ghost’ has specific cultural connotations for East and South-east Asian Chinese who celebrate the Hungry Ghost Festival during the seventh lunar month. It is believed that ghosts are released from hell for the month and are allowed to wander the earth. Some are good spirits, and others malevolent, but what they are is hungry – for food and entertainment. To appease these ghouls, food, ritual offerings and performances are proffered. 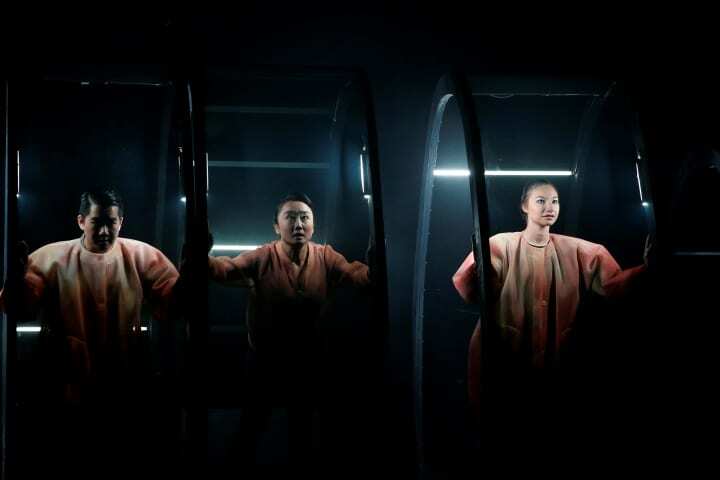 In Hungry Ghosts, three performers ghost a series of roles across scenes of Malaysia’s 1MDB scandal, the disappearance of the MH370 aeroplane and a young gay Malaysian woman’s migration to Melbourne. They are like water ghosts, who are thought to drag people underwater during the Hungry Ghost month (popular superstition: no swimming during the 7th month!). From the onset, audiences are submerged in an underwater hell conjured by light, sound; and the worlds within worlds are played out against a series of arches that the performers transform into abstract structures that range from prawn, to plane, to layers of the netherworld. 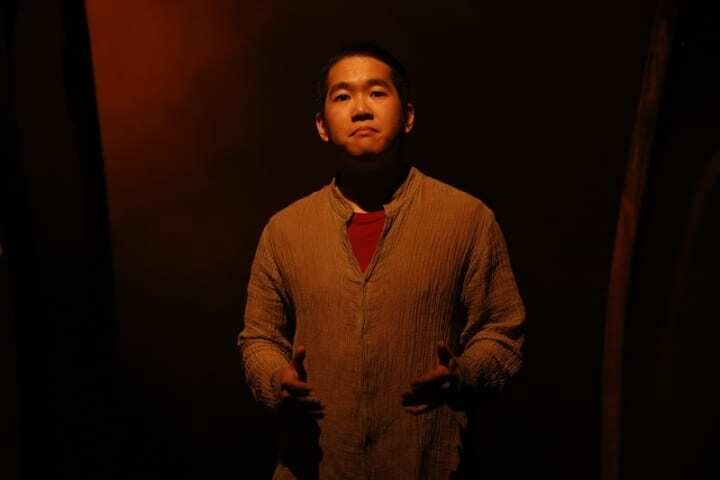 It is here that playwright Jean Tong’s impassioned interrogation of the strange and outrageous incidents of Malaysia’s recent history take place. The many ghostlike characters in the play hunger not for food, but for answers. They ask many questions: where is the plane? What did Altantuyaa know? Why are my country’s politicians so corrupt? Where is home? Why do I love my country? While many are rhetorical, others are questions that beget more questions. Frustrating, but that could be Tong’s point, that these are questions that need to be asked – and shared. Hungry Ghosts is also Tong’s biting lament for a homeland that has disappointed, and it brims with anger and heartache. The situations appear hopeless, and although it rumbles with an undercurrent of hope, the characters are stuck, waiting or searching for answers. The play’s sense of limbo fittingly captures Malaysian sentiments of being repeatedly let down by their country. At the conclusion, nothing is resolved, and we go back to the same elliptical questions we began with. For the audience, there is no surfacing for air from the hungry ghosts’ watery abyss. This was the end of the play, or was so for seven days. But the momentous results of the recent May 9th Malaysian elections changed that, shifting how Hungry Ghosts can be read. UMNO, the then ruling government was defeated in a surprising turn of events brought on by the power of the people of Malaysia who were hungry for change. Post May 9th, Hungry Ghosts has become a historical collage of impressions of what Malaysia was, as the nation now strives to rebuild itself and right the wrongs of the previous regime. It is early days of the new government, and while there are inevitably reservations about Prime Minister Mahathir, one can’t help but feel the very palpable and joyous resurgence of hope in Malaysia. Questions of justice, democracy and accountability are being asked and most importantly for the hungry, the answers are coming. Kaylene is a theatre maker from Singapore. She has created performances, audio and site-specific works as a writer, director and performer with the theatre company, spell#7. Her sound works include Desire Paths (2004-2014), an immersive audio walk of Little India_, Sky Duet (2008), an audio experience set on the Singapore Flyer, commissioned by the Singapore Biennale, Dream-Work/Dream-Home (2009), an audio walking performance for the Singapore Arts Festival set between Shenton Way and Chinatown. In 2008, she received the NUS-FASS and The Old Parliament House (TOPH) Writing Fellowship where she developed an audio-video triptych set in Peninsula Plaza, along the Singapore River and at the Armenian Church. As the recipient of the Arts Creation Fund in 2010, she conceptualised an audio-video journey along the North East train line, Ghostwalking. Kaylene has collaborated with numerous companies in Singapore, including Theatreworks, Orangedot Productions, Evil Empire and The Necessary Stage. 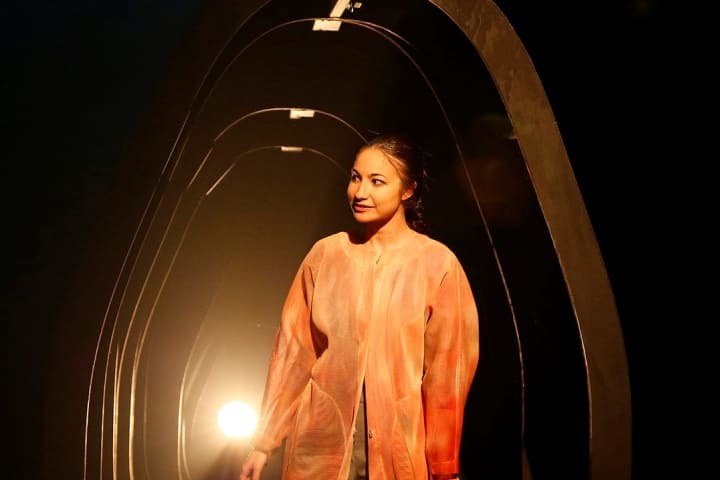 Her most recent work was a multi-sensory headphone theatre performance commissioned by The Esplanade Theatres on the Bay Singapore’s Studio Season in April 2018, In the Silence of Your Heart. She is currently based in Melbourne, Australia. 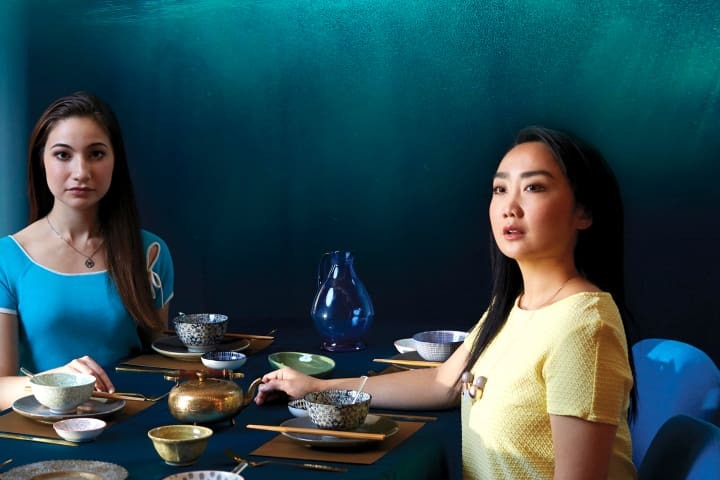 Hungry Ghosts played at Southbank Theatre, The Lawler 3 – 19 May, before commencing a Regional Tour.